Get 3 to 4 times the productivity from your people. Move items faster, easier, safer, with less product damage with the yel-Low Safety dolly. The yel-Low Safety Dolly is a truly innovative and “indestructible dolly” for any industry. It can carry mattresses, large flat screen TV's, bulk items like kayaks or ping pong tables, headboards, desks, sofas, chairs and most items up to 1000 lbs. With a powder coated uni-body steel box, the yel-Low dolly sits 1/4″ lower than a 3-inch floor dolly and an inch lower than a 4-inch dolly. It's about the height of a pallet. The low loading height allows one person to tilt an object to load it instead of lifting an object onto the dolly. The tilt vs. lifting allows one person to load and go instead of two person loading or 4 person carrying. What makes this a truly innovative moving device is the post system that allows the dolly to be reconfigured for any job at hand. The Dolly Max is an all-terrain and portable multi-function cart. It was inspired by a shop who liked the Panel Express for sheet goods but also wanted to carry cabinets with the same cart. It is used as a tear-out dolly for demolition, moving dolly, sheet rock dolly, yard cart, mattress cart, moving dolly, furniture dolly, scaffolding dolly, fence dolly, lumber cart, drywall cart and more! Large 12.25″ foam filled all terrain flat free tires on the rear, with 5″ locking casters on front allow the user to easily cross thresholds, air hoses, yards, and other rough terrain. Easy to transport to the job site! MovePro is perfect for both residential and commercial use. Designed for moving the MovePro offers the same great features and capabilities as our yel_Low Dolly but with a narrower width for getting up or down truck ramps. The smaller width also allows for use in ultra tight spaces besides fitting major rental truck’s loading ramps. 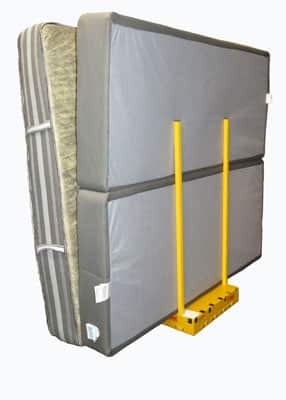 If you are renting a moving van or truck this moving dolly is the perfect companion allowing you to move mattresses, head boards, wide screen TV’s and other items up to 1000 lbs. Low profile design makes for easy loading!